Covasna Country is a very famous destination for all who want to relax or have a treatment for different diseases – it is the realm of mineral waters! Just to relax and enjoy the wonder baths, I stayed at of the best hotels in Covasna, Clermont Hotel! The carbonated, chlorinated and ferrous mineral waters are the results of postvolcanic manifestations and, due to their therapeutic qualities, Covasna became a valuable European resort. It is focused mainly on the treatment of cardiovascular diseases. The type of the gas emissions, the large number of mineral springs with high flow and the placement of these resources in a natural environment with significant therapeutic effects, create an exceptional spa resort here. Clermont Hotel offers rooms and facilities for all kinds of clients and all age categories. More specific, each person finds what he needs and that’s why there are many loyal customers: elderly people who come for medical treatments, families with children who stay here for a clean air vacation and young couples who choose an escapade here just to stay at the pool or in the jacuzzi and relax. 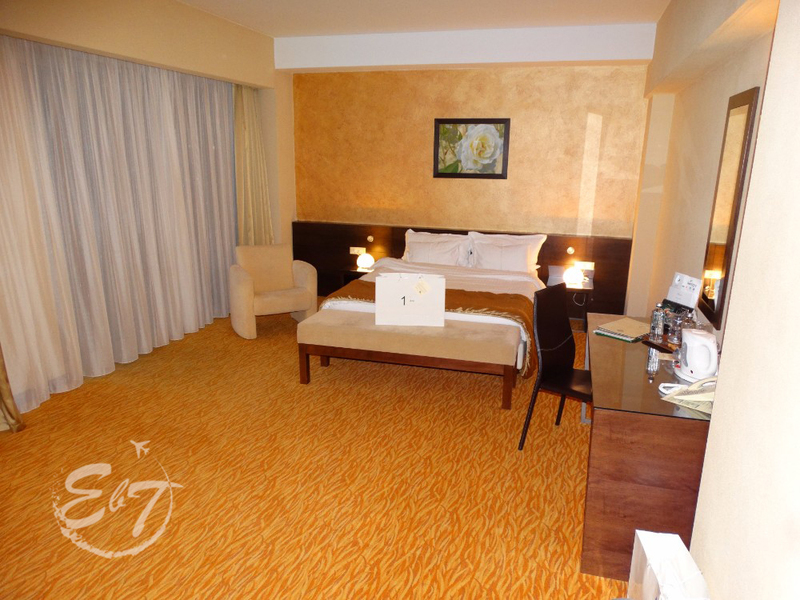 They have standard double rooms (which are very spacious), apartments, junior suite and senior suite, all with spa access. A double room starts at 80€. Most of the rooms have a great view of the mountains. Did you know that the cranberry brandy and the plum brandy are the traditional drinks in Covasna? Well, don’t miss them! You’ll love them! We had dinner at the hotel’s restaurant, a very well-rated place to eat. They have delicious food: international cuisine but also Romanian flavors and traditional dishes. And all products are local and natural (eggs, sheep pastry, beef and lamb, pork and mil) and part of them are obtained in the hotel’s own farm. I must admit that the jacuzzi… it was love at first sight! 🙂 Also, neither the swimming pool is negligible. By day, you have a great view outside, to the mountains and trees. Relaxing at the highest level! The spa also includes sauna, a fitness center, Turkish baths, massage, body wrap, body scrub, facial treatments and many beauty services. I visited the health center and I saw that it is one of the most equipped and diversified treatment bases of Covasna. First of all, you have mineral water baths, where it is used the water with high content of carbon gas, dissolved carbon dioxide and CO2 bubbles – used in improving peripheral circulation. In the hydrotherapy section, you will find baths with carbonated water, galvanic baths, aerosol dispensers, multifunctional tubs for jacuzzi, aroma hydrotherapy, underwater shower etc. Don’t forget about the natural mofette, a pit where the CO2 is stored. When you stand there, the gas has the effect of increasing blood flow through the penetration of CO2 through the skin and muscles. If you need electrotherapy, different procedures such as interferential currents, diadinamic currents, Trabert currents, magnetic fluxes, short waves, ultrasound, laser therapy, lymphatic drainage are available. Cardiovascular disorders such as arteriopathies, chronic ischemic heart disease, hypertension, venous disorders, post-stroke sequelae, locomotor system diseases (joint disorders, spinal disorders, rheumatism or osteoporosis), endocrine diseases, nutritional diseases and diseases of the peripheral nervous system. And here comes another interesting part. When you’ll get bored with the jacuzzi (haha), go to the „club” area and have some fun with your friends. Choose between bowling, ping-pong and pool table. Or do you want some activities outside? No problem! The Clermont Hotel has a tennis court and equipment, bicycle rental and a playground for the kids.